KISS released “Monster” in 2012, an album that rightfully pleased their fans a lot! So, it was about time they were coming back to Europe after 3 years and their “Sonic Boom Over Europe” tour in 2010. It was Prague’s turn in a packed O2 Arena when at 9:15 we heard the scream “Allright Praaaaague!!! You wanted the best, you’ve got the best! The hottest band in the world – KISS!”. 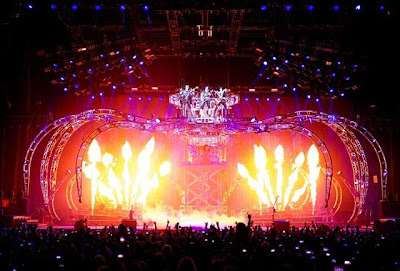 As the curtain falls we see the “spider” on top of the stage with Kiss –like they were coming out from a fairytale- playing “Psycho Circus” destroying the arena and every inhibition, or suspiciousness that anyone could possibly have that night. Without losing any time stronger than ever Kiss carry on with “Shout It Out Loud”, and “Let Me Go Rock’n’Roll”. Two huge banners with the legendary Kiss Army logo are on both sides of the stage and the four masked knights wouldn’t leave you alone with “I Love It Loud”, “Hell Or Hallelujah” and “War Machine” where the “Demon” Simmons spits a huge flame from his lungs! “Heaven’s On Fire” and “Deuce” are up next with the tireless duo of Stanley and Simmons portraying their amazing feeling for what they do. Eric Singer and Tommy Thayer take the lead on “Shock Me” until the first chorus and the jam followed by a fireworks effect, after the guitarist sung on “Outta This World”, another song from “Monster”. Their last four songs before the encore is simply devastating: “God Of Thunder” with solo, blood and Simmons flying around while the crowd is in ecstasy. Even some of the coolest ones are flabbergasted now! “Lick It Up” and “Love Gun” where Stanley flies over our heads, while on “Rock And Roll All Nite” there is absolute mayhem with Simmons and Thayer on two gigantic hydraulic platforms over the crowd thirty meters inside their stage set, while Stanley destroys his guitar. The encore features “Detroit Rock City”, “I Was Made For Loving You” and “Black Diamond” on a crescendo of fireworks where Singer proves not only his amazing vocal abilities, but the fact that kept the band in perfect shape throughout their latest studio albums, as well as live shows, as well. This is a two-hour great show that doesn’t make you regret your choice to attend. It’s worth it! Yes, Kiss are better than 2008, and 2010. I don’t know how they do it, and I don’t care. They are better. They released two very good albums, they tour, as they celebrate their 40th anniversary of a successful career and looking ahead because the future belongs to the strong ones!